Hi all!! Hope you all had a great weekend and an awesome Mother's Day! So, there has been so much going on in my house that it has given me no time to spend here, but I am trying. Today I want to take a step back and tell you all about our Bahamas trip. I started to, but never got to it once we returned so here goes. It was snowing the morning of our flight....I was already sad about leaving my kids, and now this snow had me worried! We sat and waited, and ofcourse there were delays! After a couple hours delay, we were finally in Nassau. 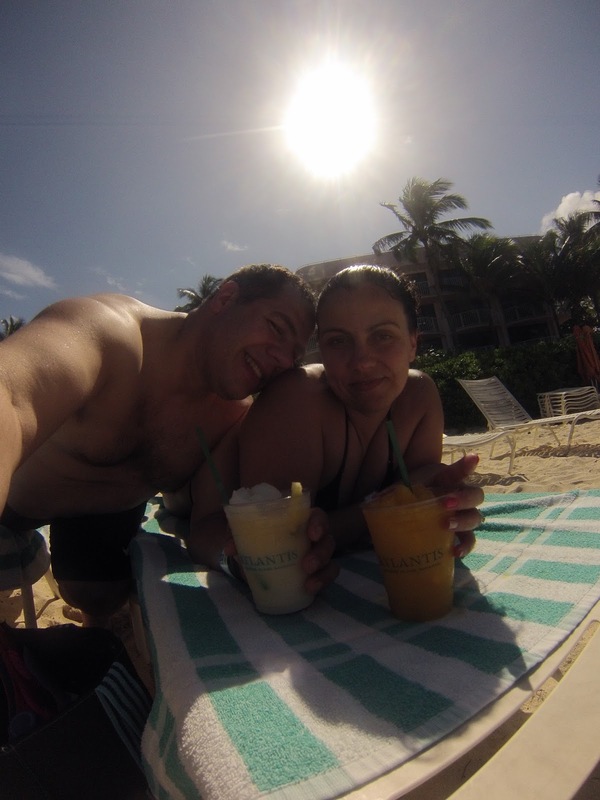 We grabbed a cab and headed to Paradise Island! The weather was gorgeous, it was so nice leaving the cold snow behind-even if only for a few days! We arrived at Atlantis, checked in to the Coral Towers and headed to our room. The excitement came to a halt when we walked into our room. First, it wasn't a King bed, we had 2 doubles - not cool! The view was terrible, but I did expect that. The bathroom had a leak. So, after hubby complained several times, I finally decided to go downstairs to see if we can switch rooms. The lady at the front desk was wonderful! She not only switched our rooms but upgraded us to the Harbour view for free! We wasted no time! Now this room was a lot better! By the time we settled in, it was too late to go swimming so we went for a walk to explore the resort and have dinner. Then we kept walking around - it was so dark in some areas but it was so much fun! The next morning we were up really early to catch the sunrise and walk around before breakfast. This became an everyday routine for us....there was no sleeping in on this trip! We also went to the gym for a 30 minute workout - no excuses, gotta stay fit! Then it was time to get in our bathing suits and head to the beach! Everywhere I turned I saw something my kids would LOVE!!! This guy looked like he was going to come out of the water, LOL! After the beach, it was time for the waterpark. Here, I freaked out a bit. I don't like heights and I don't like big slides or anything resembling a roller coaster. Yea, big time chicken over here!! But, I must admit, the few things I did get on were a blast!! There is definitely something here for everyone. After the waterpark, which closes at 5, we took a walk by the beach and then went up to our rooms to get ready for dinner. We clean up nice, don't we? Dinner was at the Bahamian Club and it was amazing!!! Well, I'll leave you all here for now. I still have the next 3 days to tell you about, so look for that in my next post!! !